They say the recession has finally come to an end, but apparently these two grandma's don't see it. 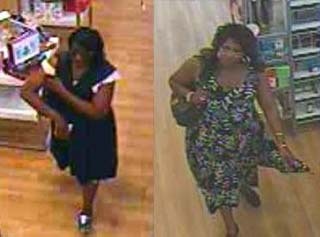 Determined to start their own fragrance business with no money down, the two women, who can be seen in surveillance photos, are said to have stolen up to $500 worth of perfume. The women entered the supply store on Aug. 10 and managed to get away by hiding perfume bottles under their dresses. As of today, they both remain at large.